Is the President of the United States a Russian asset? That question, which sounds like the plot for some second-rate geopolitical thriller, was on everybody’s lips this past weekend after a pair of bombshell stories from The New York Times and The Washington Post. The Times reported that law enforcement officials became so concerned about President Trump’s behavior after he fired ex-FBI Director James Comey that the FBI started an investigation into whether Trump was secretly working on Russia’s behalf. Then the Washington Post reported that the President had gone to great lengths to conceal details of his meetings with Russian President Vladimir Putin, including taking the notes from his interpreter and not allowing him to discuss the details of the meeting with other people in his administration. In case you’re wondering, no, that’s not normal behavior for a US President. The White House called the stories inaccurate, without ever pointing out specifically what was not right about the articles. But here’s the craziest thing. Trump was asked the question directly by Fox News host Jeanine Pirro. He said that was the most insulting thing he’d ever been asked. But he didn’t say no and that just lit up the Twitterverse. Finally, the partial government shutdown, now 24 days old, is the longest in US history. Most Americans blame Trump and the GOP for this mess, but it still seems like we’re a long way from a solution since the President and the Democrats haven’t shown any signs of budging from their positions. Some federal workers missed their first paychecks Friday, but that’s not all of the damage. Here are 77 other direct effects of the shutdown. There are questions right now about whether the government shutdown had anything to do with a huge airport security breach. A passenger with a firearm flew from Atlanta Hartsfield-Jackson International Airport to Tokyo Narita International Airport on January 3. The passenger went through screening at a TSA checkpoint in Atlanta, but for some reason “standard procedures were not followed,” the TSA said in a statement. The TSA dismissed suggestions this happened because of the shutdown, during which hundreds of TSA agents have called in sick. A TSA checkpoint at George Bush Intercontinental Airport was shutdown Sunday because of “staffing issues associated with the partial shutdown of the federal government,” the airport said. New rules from the Trump administration that would have weakened Obamacare’s contraceptive mandate have been blocked by a federal judge. Judge Haywood Gilliam, Jr. stopped the new rules, set to go into effect today, which would have allowed more employers to get exemptions to the Affordable Care Act’s mandate requiring them to provide insurance coverage for contraceptives with no co-pay. The judge’s injunction only covers the 13 Democratic states (plus the District of Columbia) that brought the lawsuit, so the rules will still go into effect in the remainder of the states that aren’t part of the legal case. 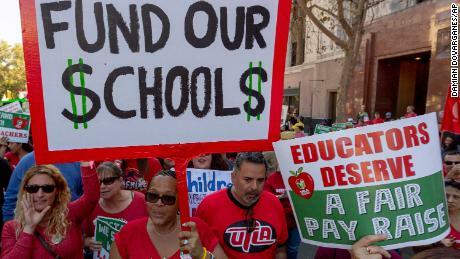 More than 32,000 L.A. teachers and staff are set to walk off the job today. It’s the first strike in 30 years for the school district, which is the second-largest in the nation. Talks between the district and teacher’s union have broken down over how much money should be used to pay for increasing teacher salaries, reducing class sizes and hiring more counselors and nurses. Despite the strike, classes will still be held at L.A. schools. The district’s 600,000 students will be taught by reassigned administrators and substitute teachers. Looks like the Mid-Atlantic states will get one more round of icy weather this morning, the remnants of a winter storm that dropped more than a foot of snow in the Midwest and killed at least seven people over the weekend. In Missouri, where the snow totals exceeded 20 inches, the state highway patrol said it responded to nearly 4,000 calls for help. Maryland, Virginia and the District Columbia will likely get another inch of snow this morning as the storm moves off the East Coast. There’s snow out west too, with up to 12 inches of snow falling in the mountains of California, with more on the way today and tomorrow. Our nice neighbors from the north proved it again. Canadian air traffic controllers sent pizza to their US counterparts hit by the shutdown. Yeah, there were some surprises and some ties at the Critics’ Choice Awards, but all you really care about are the red carpet pics, so here they are. HBO has finally told us the exact day when the beginning of the end for “Game of Thrones” starts. Perhaps the worst-kept secret in Super Bowl history has been revealed: Maroon 5 will headline the halftime show next month in Atlanta. British Prime Minister Theresa May will warn UK lawmakers today they either need to OK her Brexit deal or prepare for no Brexit at all. May is set to give her warning during a speech before a group of factory workers ahead of the UK Parliament’s vote on the Brexit deal tomorrow. The cockpit voice recorder from Lion Air Flight 610 has been found. The flight crashed into the Java Sea two months ago, killing 189 people. The score UCLA gymnast Katelyn Ohashi earned Saturday at Under Armor’s 2019 Collegiate Challenge. Ohashi’s dizzying routine lit up the crowd — and social media, too.